A Gorkha Janmukti Morcha delegation led by Bimal Gurung met Prime Minister Narendra Modi in Delhi today and purportedly told him about his Siliguri speech in which he had said "the dreams of Gorkha are my dreams". Binay Tamang, the assistant secretary of the Morcha, termed the meeting as "positive and fruitful". "We are hopeful that the Prime Minister of India will fulfil the dreams of the Gorkhas," he said. On April 10, 2014, Modi, while addressing a public meeting at Khaprail near Siliguri, had said: " Gorkha ka sapna mera sapna hai (the dreams of Gorkha are my dreams)." Tamang said: "We told the Prime Minister that this particular statement of his had given hope to the Gorkhas." The Morcha delegation, which included president Bimal Gurung, Roshan Giri, Binay Tamang, Anit Thapa, Harka Bahadur Chhetri and Arun Sigchi, also submitted a memorandum to Modi. "We have also talked about the dream statement in the memorandum we submitted to the Prime Minister," said Tamang. The memorandum states: "Sir, we would also like to remind your good self that during your campaign meeting in Siliguri in 2014, you had stated that " Gorkha ka sapna mera sapna hai". The statement had sent a wave of hope and encouragement among Gorkhas." The Morcha leaders were accompanied by Darjeeling MP S.S. Ahluwalia. The memorandum said the Morcha had ensured the victory of BJP candidate Ahluwalia. It said the Morcha also "contributed in the victory of BJP candidates in the 2014 Lok Sabha elections in the states of Uttarakhand, Himachal Pradesh and Assam". The hill party said in the memorandum that the word "Gorkhaland" had been legitimised. "The word "Gorkhaland" has also been legitimised by West Bengal state government by passing the Gorkhaland Territorial Administration Act in the state assembly. Now Gorkhaland is a legitimised word and even the President of India signed the GTA Bill which gives his assent to the word Gorkhaland," the memorandum states. The first official meeting between Gurung and Modi after the latter became the Prime Minister lasted for 30 minutes. "We spoke to him about the Gorkhaland demand since 1907, the contributions that have been made by our people and also about the fact that we have supported the BJP for the past eight years," said Tamang. The Morcha delegation also met Jayant Sinha, the minister of state for finance, today. 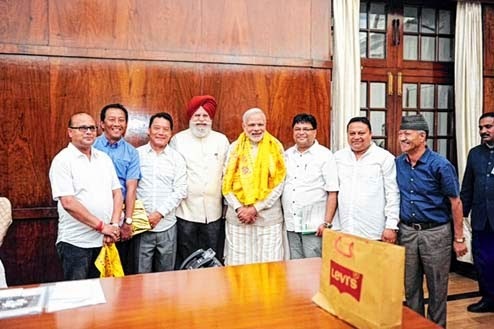 Bimal Gurung team meets Modi, submits Gorkhaland memorandum - A Gorkha Janmukti Morcha delegation led by Bimal Gurung met Prime Minister Narendra Modi in Delhi today and purportedly told him about his Siliguri speech in which he had said "the dreams of Gorkha are my dreams".